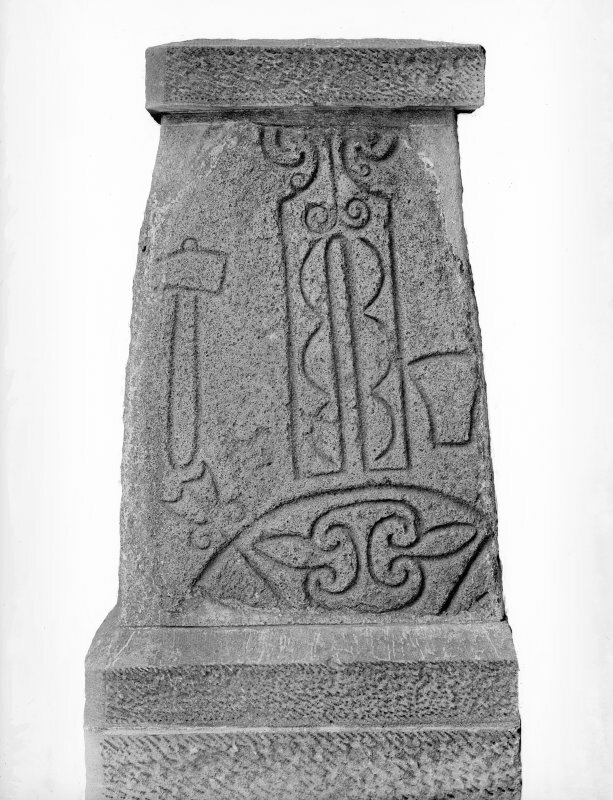 Abernethy symbol stone and cross-slab from Kingoldrum. 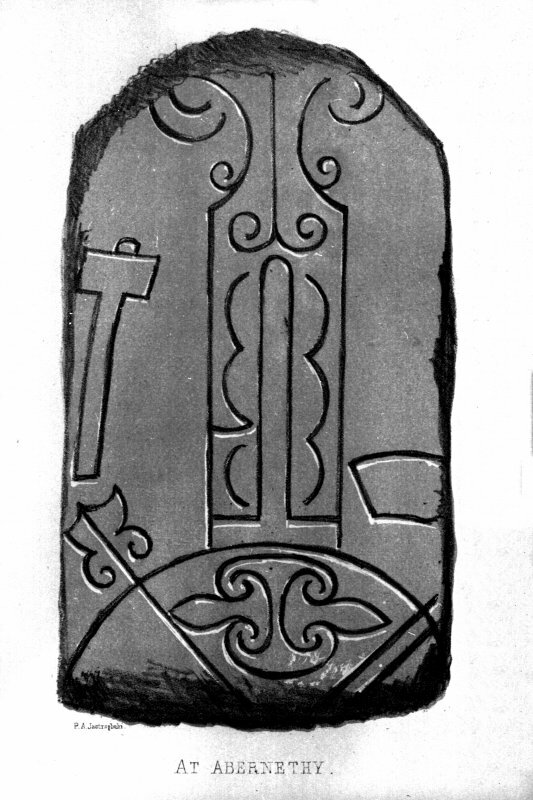 From J Stuart, The Sculptured Stones of Scotland, i, pl.xlix. Filed under NO35NW 3.02. 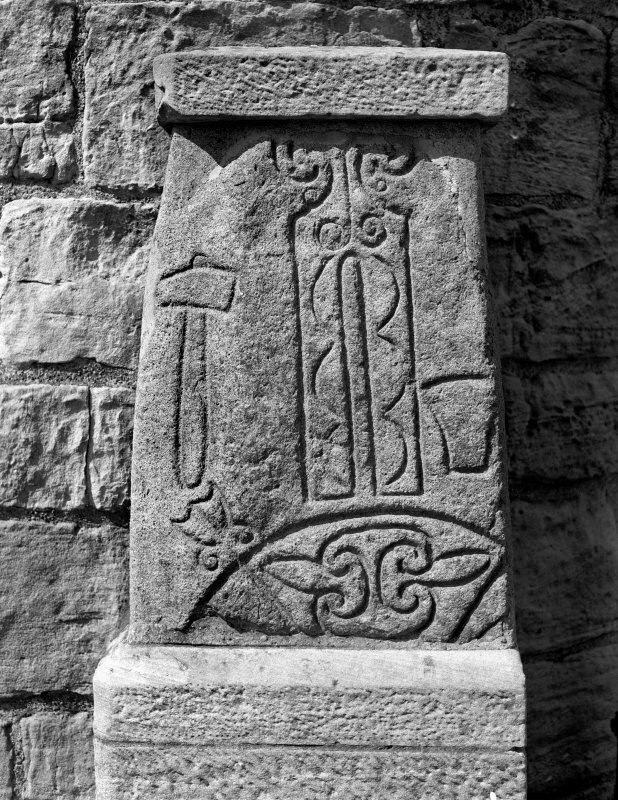 View of face of Abernethy no 1 Pictish symbol stone, from 'Mornington', School Wynd, and now held at Abernethy Round Tower, Abernethy. Present location: set on a plinth against Abernethy round tower, next to the gate into the graveyard. Evidence for discovery: discovered in the foundations of a house in the burgh in the nineteenth century and built into another house before the end of the century, before being set against the east side of the round tower sometime in the twentieth century. Present condition: carving in good condition. The stone was trimmed for re-use in such a way that most of four symbols have survived (the reverse of the slab is hidden). 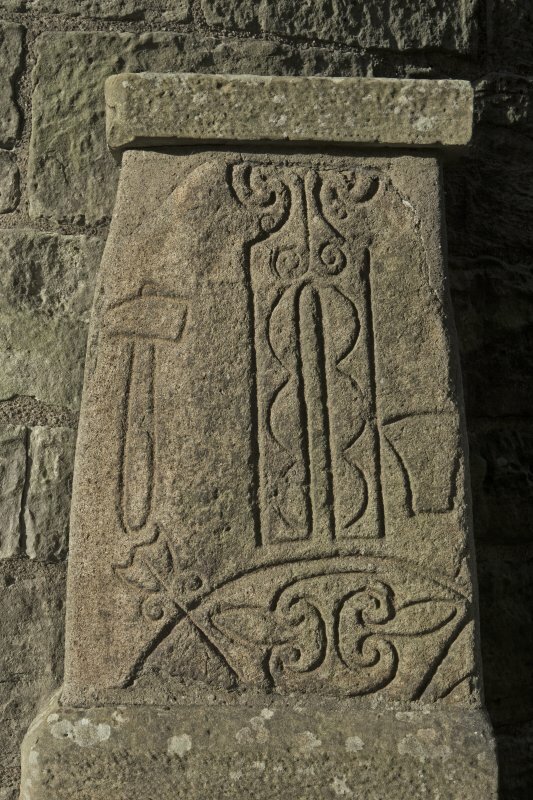 It is incised with the tuning fork symbol, flanked by a hafted hammer and an anvil, and below there is the upper left part of a crescent and V-rod with an internal double-spiral design. References: Butler 1897, 229-30, pl 1; ECMS pt 3, 282; Proudfoot 1997, 48; Fraser 2008, no 175. Compiled by A Ritchie 2016. For Abernethy Round Tower (NO 1899 1638), see NO11NE 1. Symbol Stone No. 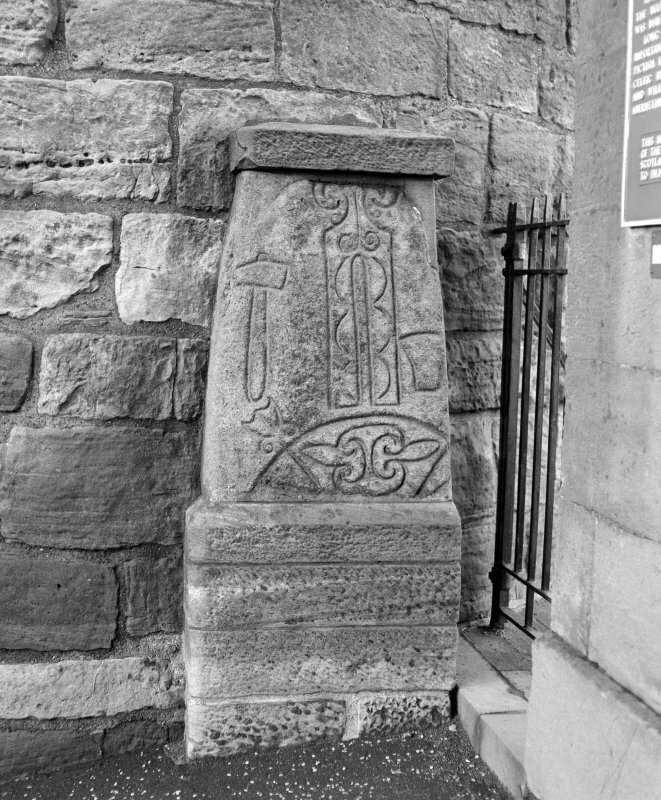 1: A symbol stone was dug out of the foundation of a house in Abernethy and is now built into the wing of the entrance to Miss Murray's house, on the east side of the street (School Wynd) leading from the railway station to the Round Tower (NO11NE 1), a few hundred yards from the tower, and less than a quarter of a mile from the station. It is a portion of a granite slab, 2'9" high by 1'10" wide. On one side it bears a 'tuning fork' symbol, a crescent -and - V - rod, a hammer, and what may be an anvil. 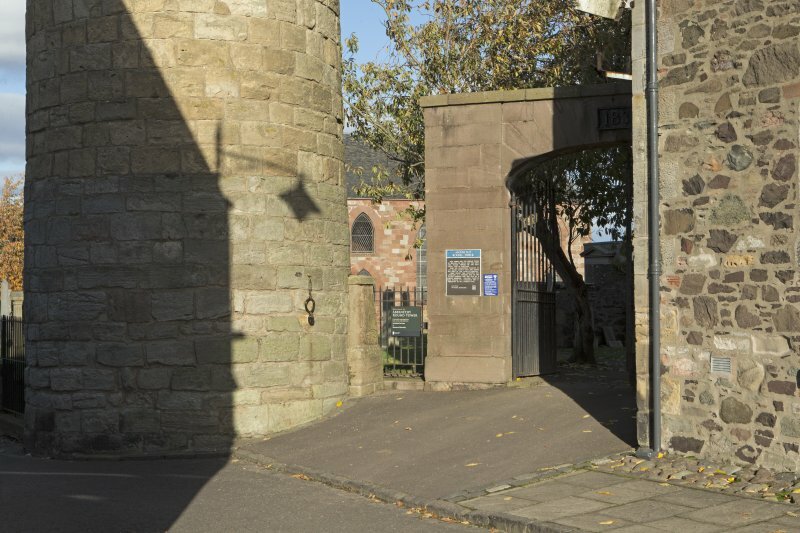 The house described by J R Allen and J Anderson (1903) is 'Mornington', School Wynd, Abernethy (NO 1896 1649) The symbol stone was removed from it some years ago and is now built against the east side of the Round Tower (NO11NE 1) at NO 1899 1639. The original find spot of the stone could not be identified. 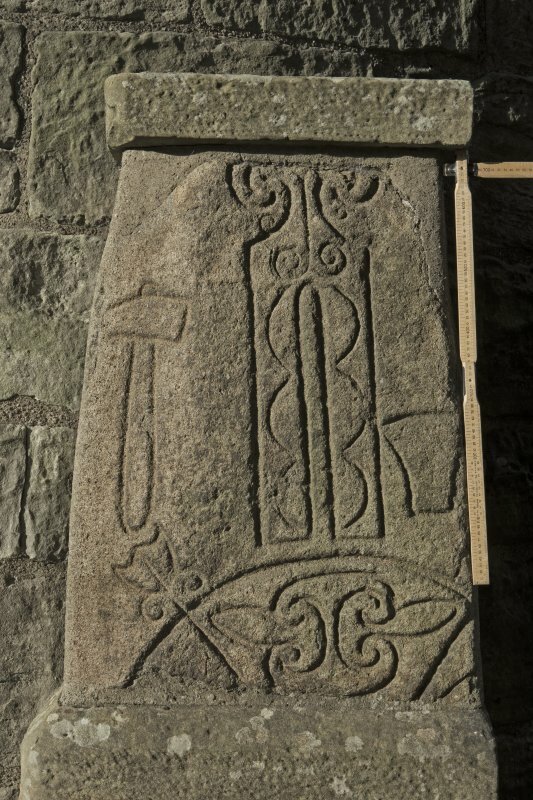 This Pictish symbol stone that was dug out of the foundations of a house in Abernethy (original findspot unknown) now stands at the base of the Abernethy Round Tower (NO11NE 1); it has been set on a plinth and is afforded some protection from the weather by a projecting stone lintel. Composed of a pinkish granite, it has been reused as a building stone and trimmed to its present dimensions of 0.9m in height, 0.65m in maximum breadth, and 0.21m in thickness. The symbols, which are deeply incised and clearly visible, comprise: a ?tuning-fork? above a crescent-and-V-rod, both enriched by abstract curvilinear decoration; and, to their left and right respectively, a hammer and ?anvil?. Both the ?tuning-fork? and crescent-and-V-rod have been truncated by the recutting of the stone. Visited by RCAHMS (IF, JRS), 27 November 1996. Class I symbol stone bearing a tuning fork above a crescent-and V-rod with a hammer on the left and an anvil on the right.